Psychiatric Times has posted the monthly installment of our contribution from H-Madness. This month, co-editor of H-Madness Greg Eghigian discusses debating the impact of media coverage of Jared Loughner’s lethal shooting in Tucson, AZ. We post it here below, with minor revisions, for your convenience. 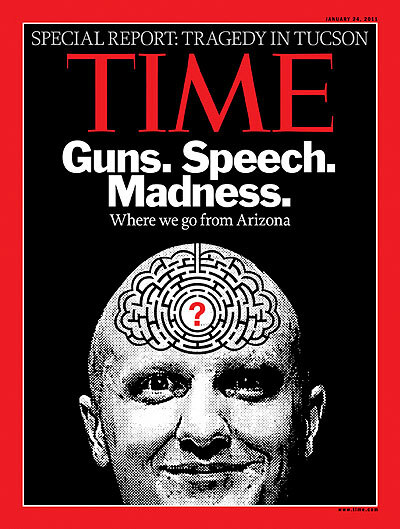 On January 24, Ronald Pies posted a thoughtful piece here entitled “Who Can Forgive Jared Loughner,” advocating the importance of relinquishing hatred in cases like the ones in Tucson and transforming “our revulsion and rage into something higher and nobler.” The piece represents one of among many – albeit, among the more considered and deliberate – responses to the events in Tucson. As we all have witnessed, Jared Loughner’s lethal violence sparked a wave of highly publicized reactions from journalists, government officials, political activists, the public-at-large, and, of course, mental health professionals. Whenever horrendous and shocking events like these occur, it is perhaps not altogether surprising that people search for meanings and explanations. Officials and the public, in particular, are often prone to look for “lessons” to take away from such tragedies, hoping to pin blame or responsibility on something (not just someone), so that it can be legislatively eliminated or regulated. A peculiar logic stamps our political culture, by which exceptions tend to make the rules. Like Bell, I was worried by (1) how quickly reporters and the public were willing to categorize Loughner as mentally ill and (2) how easily those same observers found it to assume a connection between mental illness and the commission of violent acts. With little and potentially unreliable information about him to go on, pundits and other observers felt free to attribute Loughner’s behavior to a psychopathology (most appeared to quickly fix on schizophrenia). Now, I was certainly willing to concede that it might well turn out that he was, indeed, suffering from a diagnosable mental illness. But my experience with clinicians over the years tells me that responsible professionals would be loathe to apply a diagnosis to someone (1) with only incomplete, hearsay information to go on and (2) without an opportunity to directly meet with the individual. I therefore read Bell’s piece as a cautionary, not a categorical, statement. As the media has historically shown time and again, they and the public are prone to seeing things in the simple terms “strangeness = instability = crazy = threat = menace,” much to the detriment of those suffering from mental illnesses and any variety of other disabilities. Bell reminds us that the vast majority of those suffering from mental illness pose no threat to others: on the contrary, they are more likely to be victims of crime and abuse than perpetrators. Moreover, as Dave Cullen has masterfully shown in his book Columbine, early reports on shocking events like those in Tucson are often pockmarked with errors – errors which get repeated so often and so quickly, that they remain largely insusceptible to correction. So, it seems to me, especially in the frantic immediacy of fast-moving, troubling events, it is critical that we approach these matters in a restrained fashion, insisting on careful analysis and guarded conclusions based on evidence from multiple sources. One of my colleagues, however, disagreed with my (and Bell’s) perspective. As someone with a family member diagnosed with schizophrenia, she argued that Bell’s and my position did a disservice to those battling serious mental disorders. A study of high-profile or celebrity shootings over the last fifteen years, she insisted, would invariably show that the perpetrators were mentally ill. By neglecting this reality, by de-pathologizing people like Loughner, she continued, I was playing in the hands of retributive prosecutors, reinforcing their self-serving image of Loughner and others like him as evil monsters. Thus, the position I and Bell have staked out presumably serves only to promote ignorance about mental illness. I now have come to think that in this debate with my colleague over the possible impact of media coverage about Jared Loughner, we both may well be right/wrong. Perhaps being proactive in getting the message out about mental illness and being more reserved about expressing judgments both carry the potential for encouraging the spread of longstanding stereotypes about those with struggling with psychiatric disorders. If so, this may be a reflection of just how deeply engrained and unassailable the stigma of mental illness remains. I came at this from a different perspective. While I agree that all forms of mental illness carry a stigma, I question political rhetoric as one factor in making non-psychotics even more disturbed than they already are. Here is a brief summary of the damage wrought by “the moderate men.” http://clarespark.com/2011/01/15/healing-trauma-mystery/. Note the learned helplessness that pervades political discourse.